Olga at her website My Cross Stitch has put together a neat step-by-step tutorial on how you can make yourself a great looking pincushion out of your very own cross stitching work. The original website is currently not available, therefore we’ve saved this useful post in our website. Scroll down further in this post to find out how this can be done. Some of you have been waiting patiently for me to post here my instructions on how I made my pincushions. I can only offer you how I made them; not everyone will feel comfortable with the way I make them, but it’s open for you to change anything you want and put it together that’s most comfortable for you. So here goes, I will do my best to explain it as clearly as possible. This is what I started with, a tin can, a very small one, but you can use any size you want, just depends how big you want to make it. 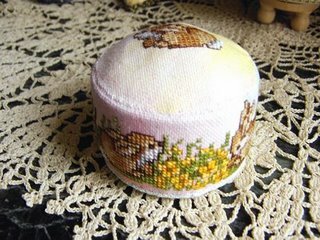 I find the smaller tins turn out the cutest pincushion, and besides you don’t really want a humongous cushion? I also traced a circle of cardboard and all I did was trace it around the tin, because you want the size of the tin. This is very important as you will see later how it will be used. I measured a piece of fabric to go fully around my tin and extra fabric for seams; I also made sure I had extra fabric that is taller than the tin as you will need to fold the fabric inside the tin and also folding it underneath the tin. So make sure you have allowed enough fabric for this. I then placed the cardboard circle onto my fabric and tacked around the cardboard. This will help to centre your image on your fabric. I then stitched my fabric ready for use. I then placed the cardboard circle onto the wrong side of my fabric that will be used for the top, and in this case it’s the little rabbit on its own. I then used the iron to fold the fabric over the cardboard circle, and what I’m after here is seam, a perfect circle to fit on top of the can for later on. You then remove the cardboard. DO NOT leave the cardboard there. This is what the front will look like, notice the perfect seam of the circle? You will later use this seam as a guide, and you can also now remove the tacking as well. Next, you will need your tin can and padding cut to size to fit exactly around the tin, and some double-sided tape. Next step is to place some double-sided tape on the centre of the outside of the tin as per picture. Next, place the padding on the tin as per picture and the double-sided tape will help hold it in place. Next, place some double-sided tape on the inside of the tin as close as possible to the top of the rim. Next, wrap your stitched fabric around the tin adjusting it so that everything is centered and straight-ish. Try to get a tight fitting when you do this, you don’t want something saggy and loose, so make sure your fabric is stretched around the tin, bit like a nice tight glove fix. With your fingers, turn in the top of the fabric inside the tin and onto the double-sided tape, this will help to hold it in place. The double-sided tape is only to help hold things for you during the stages as you go and will remain there, but the thing that will hold it together firmly and strongly is the hand sewing. Also, where the side outside seam meets, only fold over one side. This will help to keep it less bulky as possible. Here, notice how I only folded one side of the fabric to create the seam, less bulky this way. Now the fun begins, I love the last stages best because you get to see the pincushion develop. You need to sew the seam to close it. You may need to lift the fabric on the inside of the tin till you sew the seam closed, and then you can re-position it again in place. This is what you should now have, the tin is covered with batting and fabric and now your seam should be sewed closed. Now place some double-sided tape around the edges of the tin as per picture. Now fold your fabric over and the tape will help to hold this. Make sure it’s a tight fit, stretching your fabric so it sits lovely. Make sure that it’s all even and that your stitching also looks even to you. Now take the round cardboard and place it on top of some extra fabric; it should be the same fabric as you used for your cross stitch. Cut a round circle bigger than your cardboard — it’s very important that the fabric circle is bigger than the cardboard. Now place some double-sided tape on the wrong side of your cardboard as per picture. Now place it on top of the spare fabric you just cut and fold the fabric over the top, again the double-sided tape will help to hold it down as you go. Make sure you have no creases on the edge, and that it is nice and smooth on the edge. This is what you should now have at this stage. Now place a bit of double-sided tape in the centre of the flat circle as per picture above. Now take the top fabric and sit it into position on top of the can. Begin to whip stitch again on the edge of where the two fabrics meet as per picture, use your ironed seam as a guide, again use tiny small hidden whip stitches, and continue going around the rim, but leave a gap so that you can fill it. Now fill the can with stuffing, fill it very well and make sure the top has a nice oval shape to it and sits above the tin. Hope I have been able to explain it clearly, if you are unsure of something, please let me know and I can edit this post. thank you again for your interest in my instructions, hope I have helped. Don’t limit yourself to just the standard cross stitch products like bed sheets, pillow covers, wall decorations and others. You can use your cross stitch to make anything you like, as far as your creativity takes you. Have a tutorial you would like to feature in CrossStitch4Free.com? Let us know and we’ll put it up here or link it back to you!